In 1984, Ferrari took the world by surprise when it revived the iconic GTO nameplate with a V-8-powered sports car. Developed as a homologation special based on the 308 GTB, the 288 GTO ultimately became Ferrari’s range-topping model between 1984 and 1987, and unlike its predecessor, it carried a twin-turbo V-8 behind the seats instead of a naturally aspirated V-12. The V-8 legacy continued with the mind-boggling F40 between 1987 and the mid-1990s, but Maranello went back to the high-revving V-12 with the F50 in 1995. 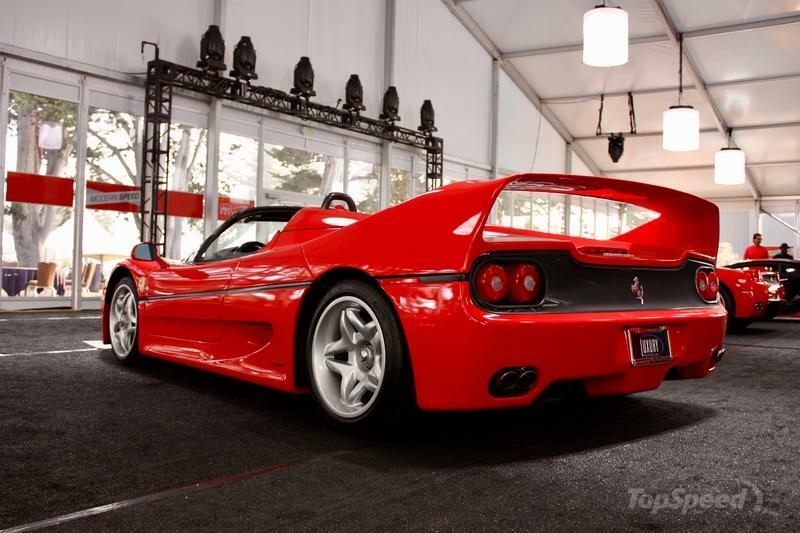 Significantly more exclusive than the F40, the F50 was built in only 349 units over two years and hit the streets with a 4.7-liter V-12 under the hood. The powerplant was based on the 333 SP’s, a race car built by Dallara that marked Ferrari’s official return to sports car racing after a 20-year absence in 1994. 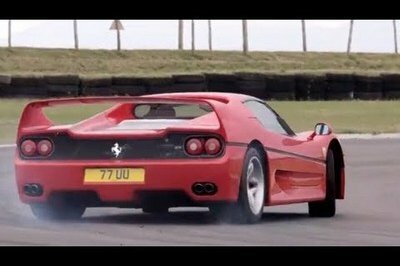 But despite using a racing engine, the F50 never made it onto the track. While Ferrari developed a race-spec version to replace the F40 LM and Evoluzione, the project was cancelled as the Italians were unhappy with the FIA having allowed homologation specials such as the Porsche 911 GT1 join the BPR Global GT Series. 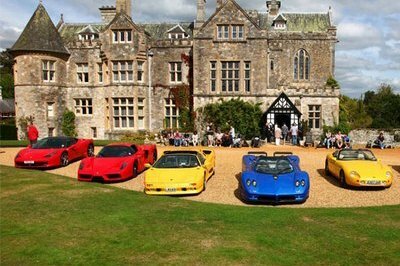 The said race car was called the F50 GT and continued its life as a very exclusive road-legal vehicle sold to select customers. A sad yet interesting story, more of which you’ll find out in the review below. 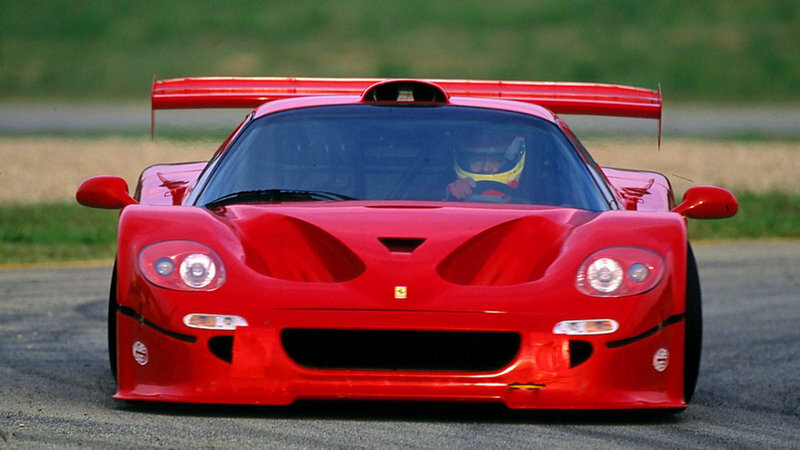 Continue reading to learn more about the Ferrari F50 GT. Flame-throwing supercars are grabbing more and more attention these days so it doesn’t really surprise us that another one was captured on video putting on a flame-spewing show. 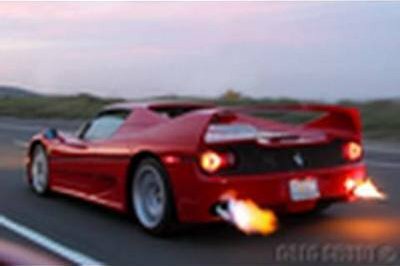 This time, it’s a Ferrari F50 romping through a California highway and in the middle of its cruising, begins spewing flames as soon as the owner pushes the pedal to the medal. It’s always a treat for us to watch how some owners use their supercars and make them do something our cars can never do – unless of course we set them on fire. If you haven’t seen a car spew flames from the exhaust before, here’s your chance. It’s not as elaborate as a the one you see in the Batmobile, but its close enough. Anybody have $800,000 to spare? 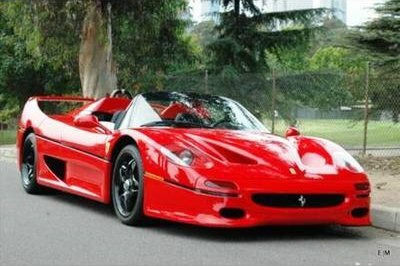 If you’re one of the few that actually do have $800,000 that you can part with without any second thoughts, then this 1995 Ferrari F50, which is being sold by its owner for around $788,888, is one item that you could actually buy. Sure, it might be 15 years old, but how many Ferrari F50s do you actually see romping around the streets these days? We’re thinking not a lot. And it’s not like this one has been used and abused by the owner. On the contrary, it’s got some pretty new and nifty modifications on it including an iPod stereo-system and subwoofers. On top of that, it’s got some suave Alcantara leather seats, a set of black rims, calipers with red logos, an Italian flag striping on the wing and a Tubi exhaust system. Best of all, for a car that’s been around the block quite a few times; it’s got a surprisingly low mileage of just a shade under 7,500 miles. So there you have it folks. 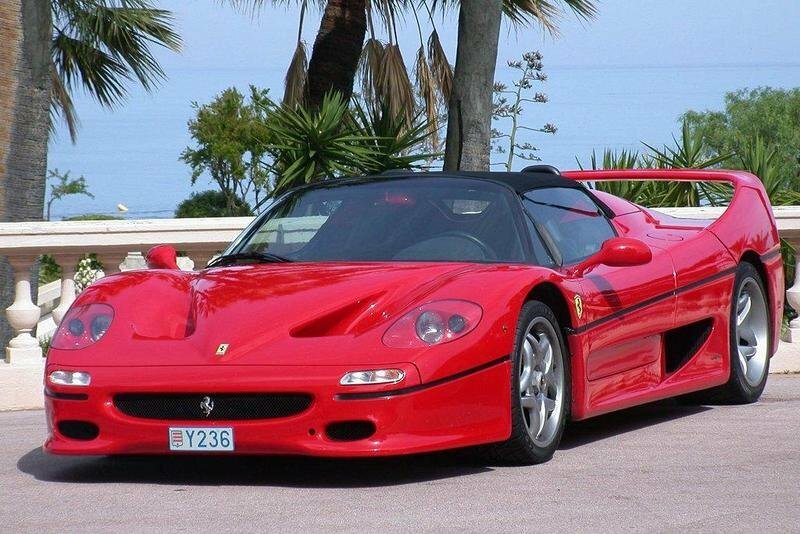 A 1995 Ferrari F50 for three-quarters of a million. Any takers? Apparently even an entity as powerful as the Federal Burrow of Investigation can’t handle the awesome potential of the Ferrari F50. This beautiful red 500 V2 powered Italian super car was being transported to a storage facility after being seized in a recent drug raid by an FBI agent. The driver claims to have been traveling at 40 MPH when the vehicle suffered a sudden blowout, causing the agent to lose control of the vehicle and smash the $550,000 super car into a tree. 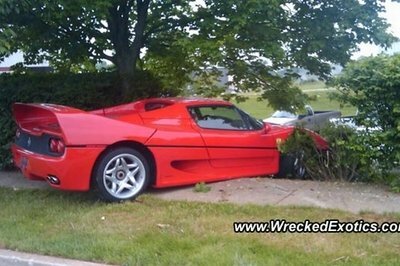 Although the FBI guy walked away unharmed, the F50 suffered significant damage. Personally, I find the whole tire exploding at 40 MPH thing to be a little far fetched. So U.S. government, next time you want to take away someone’s 500 HP Italian super car, give me a call, and I will be more than happy to make sure it ends up where it needs to be safely. 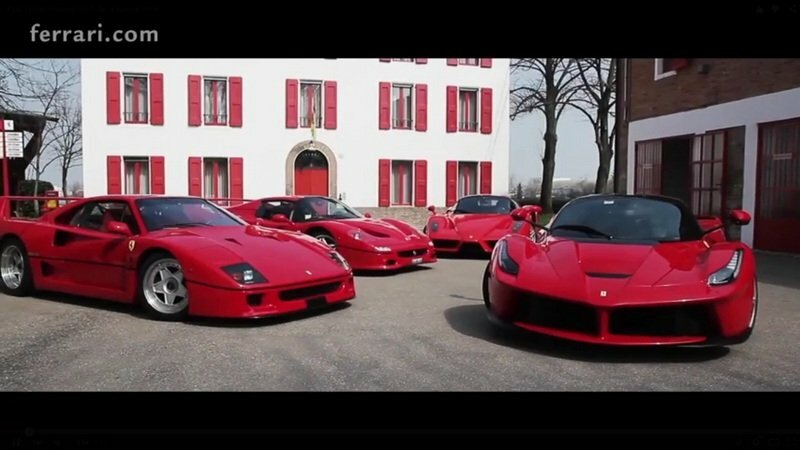 The Ferrari F50 doesn’t get a whole lot of respect in the super exotic Ferrari circles. 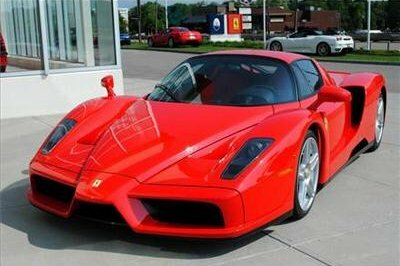 It was rumored to be no faster than the F40 it replaced, and its replacement, the Enzo, may already have its replacement on the way. So what better way to get this car a little cred than show is got some drift chops? 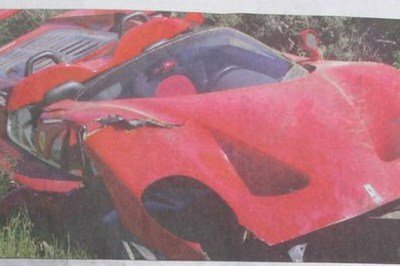 We are always sorry to report about a crashed supercar. And this time more than ever: we are talking about a 1995 Ferrari F50 owned by a museum in Frank Hoek, South Africa. The son of the owner of the museum decided to take the F50 to a ride. And the result... well it needs no comment the picture say it all. South African media said the car is a total loss, but the owner of the museum denies this. According to him, the F50 cand still be repaired and return to old state. Hard to believe considering almost all the essential components are shielded: body, the left rear suspension and the right front suspension, the oil coolers and radiator, three rims and tires must be replaced. But there is always hope. We have to say that the carbon fiber body will have a high cost, because carbon fiber is extremely expensive and thus restore too. The accident was not caused by the owner or it reckless driving or excessive speed, but it was described as a ’normal’ accident. I wonder what does this mean? In its early days, over 50 years ago, Ferrari built cars which could be used, with only a few minor alterations, for Formula 1 or Sportscar events or everyday on the street. However, as Formula 1 cars evolved, it became impossible for someone who was not a team driver or a collector capable of passing a series of private tests on the track, to take the wheel of a racing Ferrari. 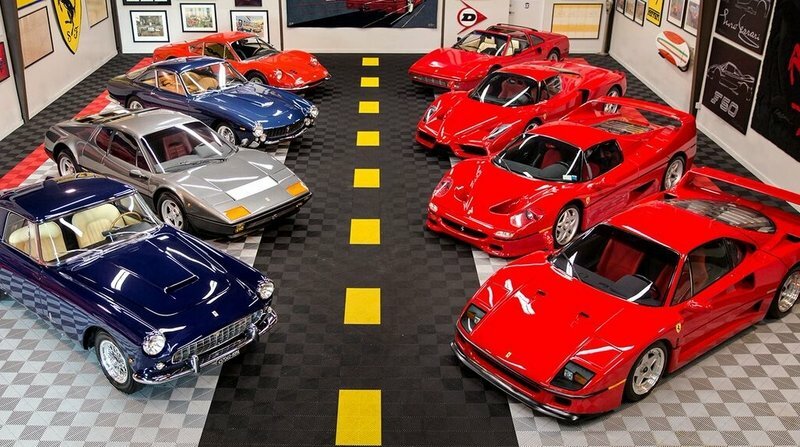 Ferrari decided to again give all its clients the chance for this experience. The F50 was the response to this technological challenge. Thanks to the research made possible by Ferrari’s vast experience in this field, producing over 45 racing models and over 120 GT and Sports models, the F50 was built to the same tolerances and with the same integrity as a Formula 1 car. The carbonfiber monocoque that enclosed the aeronautical rubber fuel tank, the V12 engine that acted as a load-bearing structure for the transaxle-rear suspension assembly, the pushrod suspension, and separate hand-braking system are formed on the basic principles of a racing car projected into the dimension of normal, safe use in all situations. The result was a car with a specific power output of 109 HP/litre and an extraordinary chassis that combined unbeatable performance with exact handling and ultimate safety even in unexpected or extraordinary circumstances.